We are soooo lucky in the Pacific Northwest! For lots of reasons, but in particular because we can grow so much food over the winter. This week, we’ve eaten carrots, parsnips, cauliflower, Purple Sprouting broccoli, parsley, chives, sorrel, thyme, rosemary, oregano, kale, Swiss chard, arugula and beets out of the garden. And I’ve discovered that as much as I love kale anytime, my favorite season for it is spring! Not the leaves, but the luscious little flower buds, or raab. 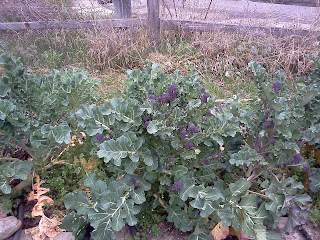 Purple Sprouting Broccoli, planted last July, eaten this week. We’re used to eating the immature flowers of the Brassica family—broccoli and cauliflower heads are just unopened flower buds. But even varieties grown primarily for their leaves produce these yummy little treats. Best of all, they’re available when most of the other food from the garden is either running out or not ready yet. 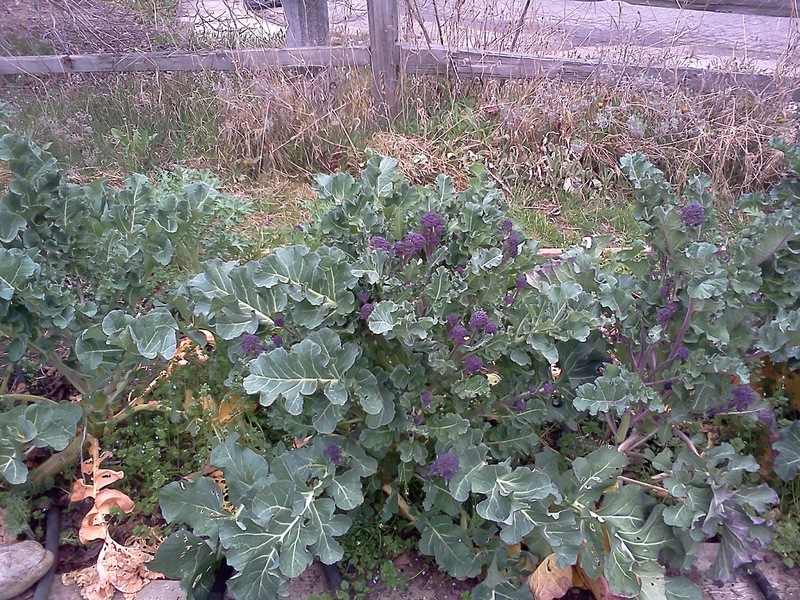 The Purple Sprouting Broccoli and some overwintering varieties of cauliflower and cabbage are maturing, but it’s nice to be able to get a few last fabulous harvests off of the plants you thought were ready for the compost heap. Most of the members of the Brassicaceae family are biennial, meaning they grow leaves their first year, then flower and (usually) die the second. They need the cold of winter to produce flowers and seeds. 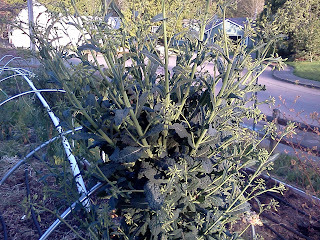 Starting in late winter, they begin to elongate and send out shoots with buds that look like tiny broccoli heads. 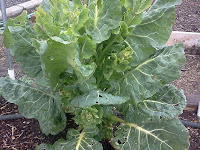 Depending on the variety, these are either incredibly sweet (kale) or have a stronger flavor of whatever they are like in the summer (arugula and cabbage.) The plants are determined to make seeds, so the more you pick the flower buds, the more they produce. The flavors are mildest when the flowers are still buds, but still tasty when completely open. Russian Kale really going to seed. It was about 8' tall! And a brand new plant (to me): Spigariello! My friend Annette gave me some seeds last summer. I have to admit, I wasn’t too excited about the long stringy leaves, but let it go overwinter. Its flower buds are the sweetest of all the plants in the garden right now! The seeds I have are from Nichols Garden Nursery, but they're not offering them this year. Terroir Seeds has a description on their website. but it's making more everyday. When is the Best Time to Plant Peas in the Pacfic Northwest? Every year, that first bite of fresh peas from the garden makes me do the “happy food dance” right out in the open. We’re partial to shelling peas in my house, so the anticipation of splitting open the pod to see if the seeds are full and plump, or if I’ve jumped the gun (I always do, at least a few times) is part of the fun. This year, I’m expecting that first mouthful to happen by the end of May, assuming we don’t have any major blizzards between now and then. I planted peas into the garden March 2nd. 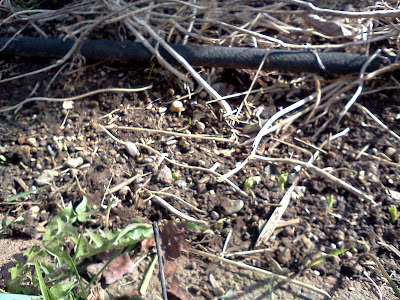 Even though I pre-sprouted them, the soil was still only about 48 F, so they just sat there, sulking for several days. I’d about given up and went out with more seeds to try again on March 12th. Sure enough, there were their little green noses, sticking up out of the ground! Like most plants, they grow more quickly in warmer weather, but now that they’re out there, they can take advantage of every sunny hour. Peas are definitely cool weather crops and can withstand light frosts without a problem. They will germinate in moist soil as chilly as 45 F, but it’s a slow process and risks rot and predation. Although they appreciate consistent moisture, water-logged soil encourages fungi that attack and can kill. Raised beds can help, as can making sure you have plenty of organic matter in the soil. The trick is to get them up and going as early as you can to ensure the longest harvest time before the weather gets warm and dry. 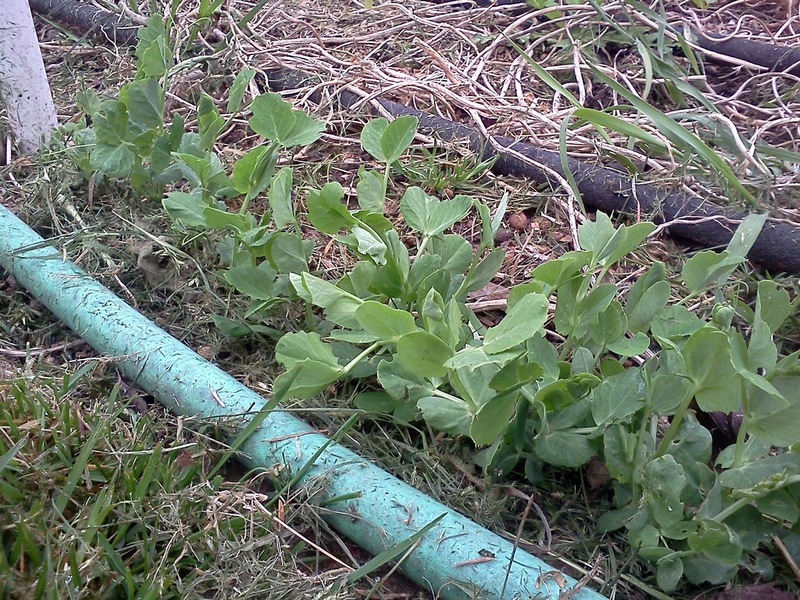 Before the weather gets warm and dry…yeah… ok, so last year the peas continued to produce into August! Most years, they start to decline and succumb to enation virus or powdery mildew well before that. 2" above them. I like to leave a little room to get in there. By soaking and pre-sprouting the seeds, you can get a head start on germination, especially if the soil is still below 50F at the surface. Place the seeds in resealable plastic bags or something similar with a little water or a very damp paper towel and keep them somewhere warm for a couple of days, checking often. As soon as they start to germinate, open the bag and get them into the ground. Be very careful of that brittle little sprout! Peas are in the Fabaceae family and most of that group are referred to as “Nitrogen Fixers.” They form a symbiotic relationship with specific rhizobium bacteria. The bacteria colonize the roots of bean and pea plants, absorbing some nutrients and in return, capturing and “fixing” gaseous nitrogen from the air in the soil. The plant uses some of this nitrogen to create chlorophyll, which it needs for photosynthesis. It’s a good idea to inoculate your pea seeds with this bacteria before planting, since it’s not generally present in great enough quantities in most garden soils. It’s usually available from nurseries and seed catalogs in small packets. I've seen greater vigor and higher yields when I've inoculated the seed. Plant peas 1” to 2” deep, depending on your soil type. Heavier soils make it more difficult for the seedling to emerge, so lean towards the 1” depth in soils with more clay. 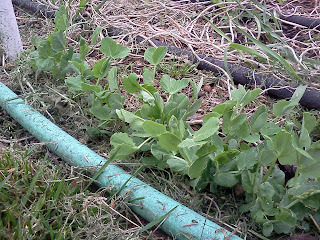 Peas rather like company, so plant them about 1” apart. 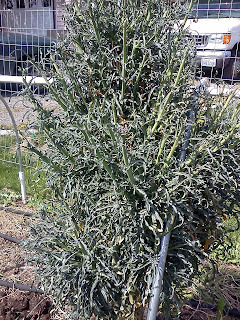 Pole, or climbing varieties need some sort of trellis for support, since some of them get upwards of 6’ tall. Peas use tendrils rather than twining, to climb, so chicken wire or similar mesh materials work better than the bamboo poles often used for beans. Do remember to put up the trellises BEFORE you plant your peas so you don’t have to work around them later. 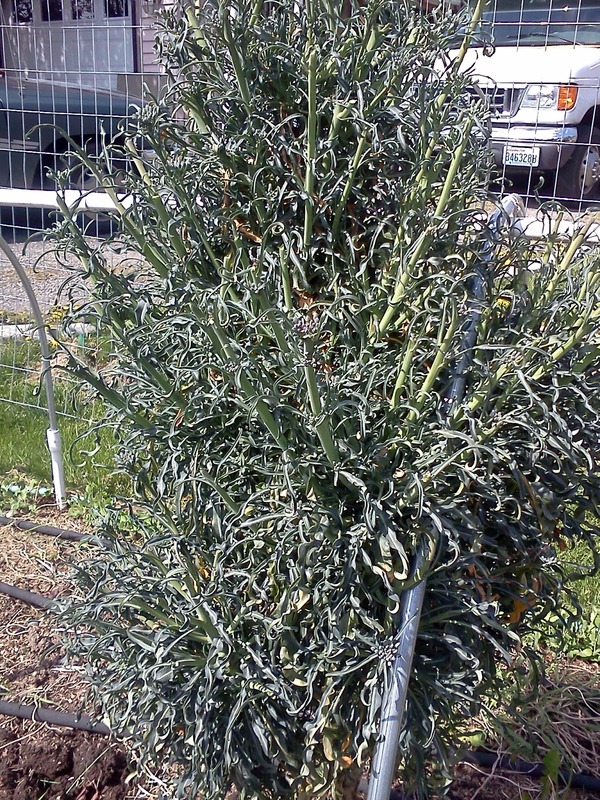 Bush varieties will just clamber up each other and form a dense clump. Planting them in rows a little farther apart with just a little support may make it easier to get in there and harvest the pods. Last year, I tried using twine and bamboo poles as a trellis. flopped over the top after awhile. So, once your soil is workable and above 45F, pre-sprouted or not, inoculate your pea seeds and get that first crop into the ground! On my way back from speaking to the Central Valley Garden Club yesterday, I stopped into what's become a new favorite--Roadhouse Nursery, owned by Jan and George Bahr. Besides specializing in water plants and gardens, they're one of the few places I've seen that offers a good selection of interesting perennials in 4" pots. These smaller plants catch up to their larger buddies quickly and are easier on the budget! I've been to Roadhouse several times for meetings of our local Washington State Nursery and Landscape Association (WSNLA), but it's always been at night, so yesterday was the first time I'd really spent any time looking at the nursery itself. The building really was an old roadhouse (and possibly of ill repute!) and it's in a simply bucolic setting. There are beautiful ponds showcasing water plants and a lovely gazebo with an view of the mountains. I was too busy chatting with Jan, checking out the vegetable starts and buying a new delphinium to take any pictures, but you can see some on the Roadhouse Nursery website by clicking here.